It’s that time of year again when yard sales are in full force. Yes, it’s definitely my favorite time of the year. Not only does it remind me that beautiful weather is on the horizon, but it’s when I purchase most of my household necessities, I update my wardrobe, and I just have fun buying both wants and needs. It’s the way I’ve saved over $100, 000. Yes, it’s Thrifting as a lifestyle. Since clearing out my clutter is one of my goals for 2014 and I’m not doing particularly well, I am trying to be mindful of how much I bring in each week and have a purpose for what I buy. I’m committed to clearing out as much I bring in, and that is definitely my challenge. My goal this summer is to decorate our new front porch and update the back deck. The back deck is basically a gathering of mismatched yard sale finds that haven’t handled the outdoor weather very well. It needs up an all around upgrade, but I’ll start with some new furniture finds. 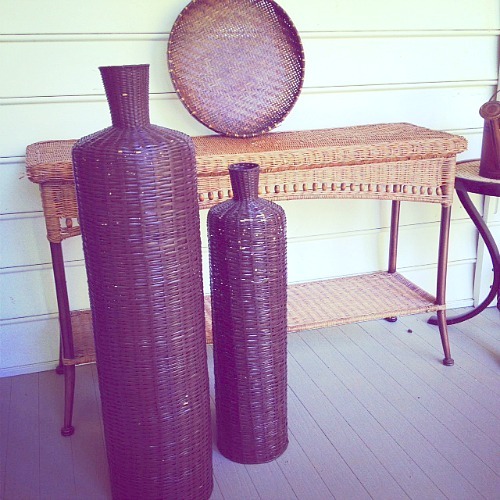 As I find possible outdoor decor, I will decide if it goes on the porch or the deck. Over the last two weekends, I’ve found some great treasures. Above you’ll see the wicker table that topped my budget at $5. I jest. Can you even believe that? I was thrilled. 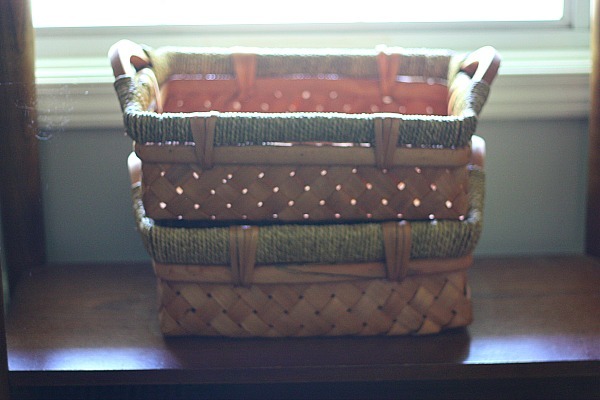 The tall decorative “vases, baskets, thing-a-ma-jigs” were also $5 for the pair and the circular basket just $1. Now I have to decide what kind of spray paint magic they need. I always lean towards hues of blue, but I am thinking a little mix and match will be necessary. All three of the above purchases are definitely for our front porch because the back deck receives much more rain. 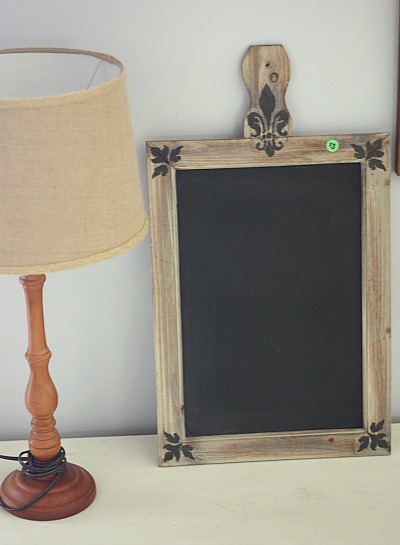 This adorable $3 chalk board will also go outside as a “Welcome” sign. I haven’t hung anything yet on the outdoor siding, so I need to research how best to do that. 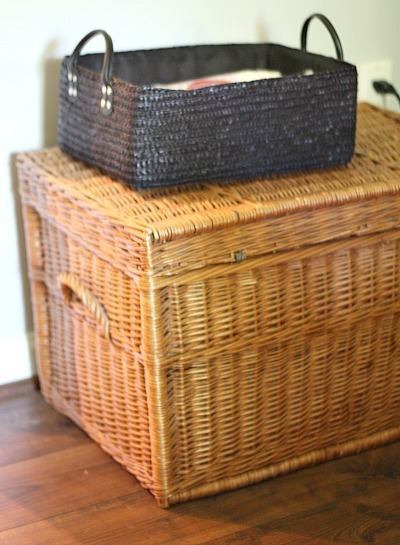 For now, it will lean against the siding on top of the wicker table. The $2 lamp is just an indoor upgrade. The shade is in perfect condition and the lamp will probably get a coat of paint once I figure out which room it will go in. A few Saturdays ago, I found this HUGE mirror. Typically, $10 is on the higher end of what I pay for something like this, but the seller wanted $20. It’s in perfect shape and it’s huge, so I snagged it at $10. The three baskets were a steal at $0.75 a piece. Even if you’ve read my blog for all five years, there are a few rooms that you’ve never seen. My bedroom is one of them. Well, I take that back. Months after I started my blog, I shared my bedroom bedlam. If you want to feel better about yourself and get a chuckle, read all about it. Basically, nothing has changed and admittedly, that is pathetic, but we can’t do it all. Our bedroom is not a haven, but I want it to be and this year, once I clear the clutter, it will be. That means getting some new furniture (or new to us furniture.) I decided to kick it off with this solid wood $30 dresser. The best part? 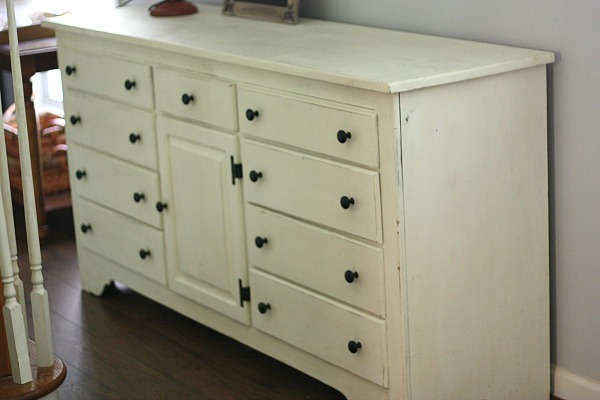 She already painted the ugly wood with my favorite Annie Sloan Old White Chalk Paint (the same color I painted my kitchen pop of color hutch). I recognized the color without asking and the paint alone cost the price of the dresser. It’s a bit beat up, so I will probably go over it with another coat to make it just like new. I love it! 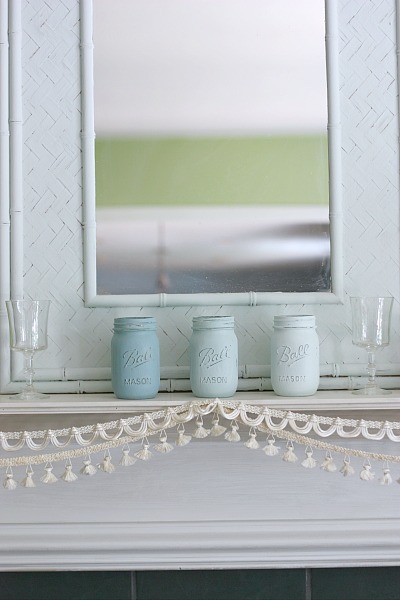 It has the matching mirror as well which is not yet painted. I will need to see how it looks in our bedroom. So, those are my big purchases for the past few weekends. I love them all and of course, I purchased a few miscellaneous cook books, beach books, a few articles of clothes for nearly everyone in the family and dishes. (HELP! I CAN’T STOP BUYING CUTE DISHES). For the most part, everything had a purpose and I can’t wait to tackle our outdoors. 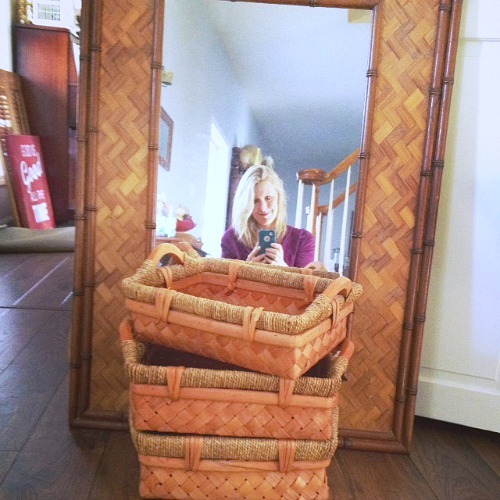 Have you found any fun thrifty treasures lately? I had a good day although I didn’t really buy much! The hubby and I are starting to talk about deck furniture and he doesn’t quite trust me to pull it together from yard sale finds! I really don’t want matchy matchy but I’ll have to see what I can find! Love your buys, Jen! My back deck is all pulled together from yard sales, but it takes time and it doesn’t look the best. When we built the front porch, I started looking months ahead of time but couldn’t find a great set. My hubby also said that we just invested in this and now we can’t even sit out there, so we splurged and bought the main sofa and chairs new new. I don’t regret it at all, but laugh that my outdoor furniture cost more than what I have ever spent indoors. Something is wrong with that. 🙂 Now I’ve been adding to it with side tables and odds and ends from yard sales so that’s been fun. I had many great finds….4 Christmas red chargers for .50 cents, an embroidery project for 1.00 and and 2 boxes of embroidery thread for 1.00, huge wooden laundry basket, several games for game night, children’s books, cargo shorts for grandson, large bunch of palm fronds…..total I spent $8.00. So much fun especially visiting with people I would have never met. Isn’t meeting so many fun, new people part of the wonder of it all. I love that. 🙂 You had a great haul, too. For hanging things on your siding I totally recommend Command hooks. I have several hanging on my apartment building siding to hang various wreaths and decorations in my small outdoor space. We use them at my mother’s home for Christmas decorations. As long as you buy the indoor/outdoor kind they will hold up fine in the elements. @Jen, You get the command hangers to hold different weights. I just absolutely love all your finds. They are great. I am clearing out the clutter in 2014 too! If I bring in something new, something has to go!…among other things. And yes, as a matter of fact I have read your blog all 5 years (I’m pretty sure I have anyway). Thanks for all your share.